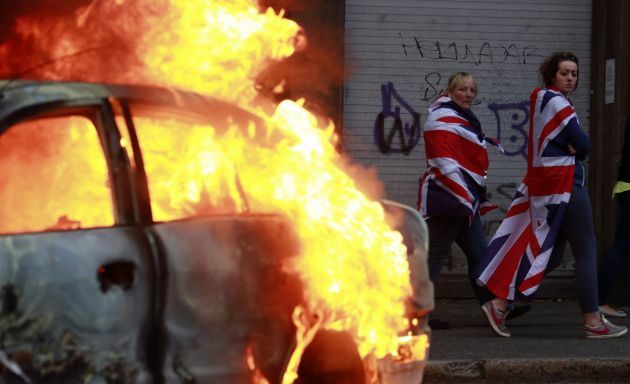 (Photo: REUTERS / Cathal McNaughton)People draped with the Union flags walk past a burning car after loyalist protesters attacked the police with bricks and bottles as they waited for a republican parade to make its way through Belfast City Centre August 9, 2013. Police fired plastic bullets and water cannon at rioters in the heart of Belfast on Friday after being pelted by missiles for the second successive night in the latest bout of Northern Ireland's sporadic sectarian violence. Police said two officers were injured. Eight were hurt the previous night when a crowd threw paint bombs, bottles and masonry at police. BELFAST (Reuters) - Police fired plastic bullets and water cannon at rioters in the heart of Belfast on Friday after being pelted by missiles for the second successive night in the latest bout of Northern Ireland's sporadic sectarian violence. Bricks, bottles and fireworks rained down on riot police when they moved in to try to clear the city's main thoroughfare - Royal Avenue - to enable a parade by the nationalist side of the community to go past. Police said two officers were injured. Eight were hurt the previous night when a crowd threw paint bombs, bottles and masonry at police. A 1998 peace and power-sharing deal largely ended decades of strife in the British province but Belfast remains divided between pro-British Protestants and Catholics who generally continue to favour unification with Ireland. The violence began on Thursday night and focused on a bonfire in the Divis Street area, a Catholic-dominated part of Belfast, where British police said they came under attack. There were eight arrests for public order offences. Police did not specify what triggered the violence. In another area of Belfast on Thursday, a man attacked police with a sword and officers fired two plastic bullets in response. The bonfire was held to mark the anniversary of the 1971 introduction of internment without trial by British authorities during Northern Ireland's so-called "Troubles." At that time, soldiers swept into Catholic districts and arrested more than 340 people as the British government sought to halt growing Irish Republican Army (IRA) violence aimed at extinguishing rule from London.